I am organizing my freezer this morning in anticipation of a delivery later today -- 75 pounds of meat from an organic farm. It's an exciting day, as I'm looking forward to once again having a freezer full of beef, pork, and chicken that was raised naturally and will taste heavenly. 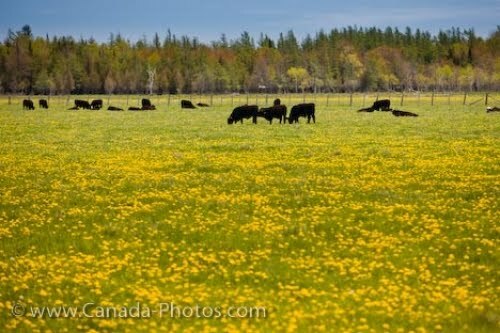 Matt and I decided last summer that we wanted to be more aware of where our meat was coming from and to reap the health benefits of eating meat from pasture-raised animals. We were fortunate to come across an organic farmer in our area through a family member, and were completely thrilled with our choice as we enjoyed wonderful roasts, steaks, chops, sausages, and much more throughout the fall and winter months. There are many physical benefits to eating meat from animals that lived healthy and happy lives. 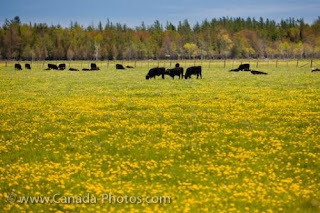 Pasture-raised beef is lower in total fat as well as saturated fats than grain-fed beef; the animals are leaner because of their high-fibre, low-starch diet and their continuous movement while grazing. Cattle who are naturally raised eat a wide variety of plants in the field, which makes their meat high in folic acid, beta-carotene, vitamin E, and omega-3 fatty acids. By contrast, animals who are fed corn gain weight quickly and have higher levels of saturated fat and omega-6 fats in their meat. While both omega-3 and omega-6 fatty acids are important for human wellness, too many omega-6s and too few omega-3s results in disease. People concerned about their heart health will be pleased to know that grass-fed beef can have the same amount of fat as a chicken breast, which means it can be enjoyed more often. In our house, the decision to go with meat from naturally-raised animals was solidified by other matters of the heart that concern us. Will, who is a sensitive old soul in a little boy's body, has been very bothered lately by the fact that we eat meat at all; the idea of killing animals for food seems very cruel to him. It is somewhat reassuring for all of us to be able to talk about how the animals we eat were raised kindly, being given the freedom to live as they liked to and eat what they were meant to before they became food for our table. We get email updates from the farm throughout the season, and we enjoy reading about the chickens out scratching and pecking and the cattle roaming in the fields. We feel that by supporting the farming practices we do, we are saying thanks to the animals for giving their lives to sustain ours. Finely chop onion, garlic, celery and carrot. On medium heat, in a deep, heavy pan, fry these ingredients with some oil for a short period. Transfer to slowcooker. Put the beef roast, sprinkled with salt and pepper, in the pan and sear the meat. (To sear is to brown the meat briefly on all sides, which keeps the juices in while the rest cooks more slowly.) Transfer beef to slowcooker. Cover and slow cook on low all day. Remove roast from slowcooker and let cool. Slice beef when cool. Serve with juices from slowcooker and an assortment of oven-roasted vegetables.